Hiking is a great way to get in some exercise, enjoy the beauty of the great outdoors and get some fresh air. It also helps kids to learn about the environment and life sciences while getting them off of the couch and away from the electronic devices that so many kids are attached to. Like most activities, however, it’s not without its share of risks. 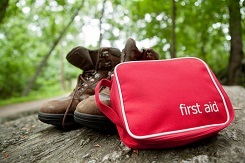 In order to ensure that everyone on your hiking trip returns in good shape, these are 10 of the first aid facts relevant to hiking that each member of your party should know.